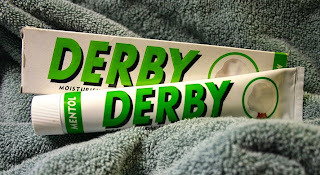 The first time I saw Derby Cream it was online searching for my next soap purchase. I had no idea they made a shaving cream. I thought since the blades are ok why not order it. So I did. When it finally arrived I couldn’t wait to give it a try. Not knowing how to really lather cream I just placed a dime size dab in the palm of my hand and with hot water worked into my wet face. Man was I disappointed at the results. I thought something’s not right. I pictured this big white beard of lather but it never happened. So I put it away and it sat in my den for months until yesterday. Now that I own a scuttle I revisited the cream. I heated up my scuttle with hot water and added just a little in the cup along with a dime size dab of cream. This time I used my badger brush and worked up a rich creamy hot lather. When the brush hit my face I was so surprised from the first time I used the product. What a difference. The cream was slick and the shave was going very well. I was even starting to forget about the fact that I really didn’t care for scent. Then it happened, I got some shaving cream in my mouth. Lets just say Derby Shaving Cream does not taste good. The shaving cream preformed well. It’s a good shaving cream but I just don’t seem to have good luck with it. So back in the den it goes. Into that place where we keep the things we wished had worked out. Maybe I’ll try again in a few months.